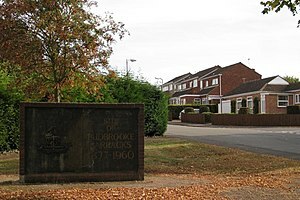 As this is my first post in Britain’s History l thought l would start with a little known village ,called Budbrooke. Budbrooke Parish is situated about two miles north-west of Warwick and is divided both geographically and historically into three main areas – the ancient village of Budbrooke centred around St Michael’s Church, Hampton-on-the-Hill, and Hampton Magna. The original parish dates from 1086 when Ralph de Limesi held Budebroc for William the Conqueror. It consisted of five hides of land, a mill, farms and woods. It was one mile long and three furlongs wide. The parish church of St. Michael dates from the twelfth century. But little is known of the event that took place in this village in fact it was In 1350, the village suffered from the Black Death and became a ghost town. Most of the village, including the vicarage and the manor, crumbled. The track which now passes under the railway arch known as Kyte’s Bridge was the most likely route for the corpses being taken from the village to Dead Field on Hatton Hill. Of the original village, only the church remains, and even that became a ruin in the mid-17th century, not to be restored until the Victorian era. When the old village declined, the centre of the parish moved to Grove Park, the home of the Dormer family who were granted the manor in 1608. During the English Civil War, a force of five thousand Royalist horse and foot soldiers paused at Grove Park to rest. The Parliamentarian supporter, Lord Brook in Warwick, was aware of their arrival and, with seven thousand men, met the Royalists. After some “negotiations” the Royalist forces marched away, joining the King and his army at Coventry. The village of Hampton-on-the-Hill, on the edge of Grove Park, became the main development area of the parish. A significant community developed there, with a shop that later became a police house, a forge, a Post Office, a club room and a public house. The Roman Catholic church of St Charles Borromeo was built by Lord Dormer and given to the parish in 1819. In the 1790s, the Birmingham and Warwick Canal was constructed, which is now part of the Birmingham “main line” of the Grand Union Canal. This passes through Budbrooke parish, and the Hatton flight of 21 canal locks that lift the canal up out of the Avon valley are just outside of the village. The barracks of the Royal Warwickshire Regiment was created in 1877 within the parish, on a site about half a mile to the east of Budbrooke church. A restored St. Michael’s church became the battalion church. The barracks remained in use until the mid-1960s. The military connections of the area are retained in some of the road names in the village, with the Royal Warwickshire Regiment itself being commemorated in a road called simply, “The Warwick’s”. Caen Close and Normandy Close recall the part played by the regiment in the liberation of France during the Second World War. Arras Boulevard commemorates the Battle of Arras during the First World War. Montgomery Avenue is named after Bernard Montgomery. The barracks site was remembered in the celebrations of the 60th anniversary of VE and VJ Day, which were held in the parish on 10 September 2005. In the late 1960s and early 1970s the barracks site was re-developed into the “20th Century Village” of Hampton Magna. As a result of the community spirit in the new village, a Community Centre was built-in Field Barn Road on land leased to the Parish Council by the local District Council. Budbrooke Primary School was built-in 1968, replacing the old school in Hampton-on-the Hill. The parish has one school (Budbrooke Primary School), which is located in the centre of Hampton Magna. There are two churches in the parish; these are St. Michael’s, a 12th Century Anglican parish church located in Budbrooke village and St. Charles Borromeo Catholic Church in Hampton-on-the-Hill. The parish is dominated by the Hampton Magna housing estate, with Hampton-on-the-Hill being the second largest settlement. The village of Budbrooke is extremely small and consists of only a few buildings. In addition, there are a small handful of farms within the parish. Finally and to even me a little known fact with a link to back it up – Budbrooke was famously the epicentre of one of the largest earthquakes in the UK in 2000, hitting 4.2 on the Richter Scale. This has since been surpassed according to Warwickshire.gov.uk this snippet l have copied and paste reports this occurrence: The epicentre of the 2000 Warwick Earthquake was at Budbrooke, just west of the town. 13 kilometres down, within the Earth’s crust, a tiny movement caused shock waves to spread upwards and outwards. The earthquake measured 4.2 on the Richter Scale and caused little damage. Warwickshire residents also felt the effects of the September 2002 Dudley Earthquake. This was slightly more powerful, at 4.8 on the Richter Scale.